With increase in application of the robotic system to general surgery, there comes a necessity of a training program for surgical trainees or novices. However there is no standardized training program for robotic surgery. This study is aimed at verifying the efficacy of our training program for multi-port and single-port robotic surgery. Three medical students and one surgical trainee participated. The program consists of basic skill training (grasping, rope running, bimanual carrying and needle passing) and suture. The da Vinci Surgical System with multi-port and single-port was used for training. Time to complete each task was recorded and scores for suture test were measured. After completion of each task, participants filled out a survey to score their performances by themselves. All tasks were performed in both multi-port setting and single-port setting, and were repeated 3 times. One way ANOVA test using SPSS was performed to validate the training effect between each time (Test 1, 2 and 3). In basic skill tests, time to completion showed a tendency to be shortened as training proceeded. There was a significant shortening of completion time especially in a bimanual carrying task and a needle passing task in multi-port setting and a needle passing task in single-port setting (p=0.002, p=0.036 and p<0.0001, respectively). In suture test, the scores increased at the final test, although it showed no statistical significance. Survey showed an increasing feeling of mastery, familiarity with technique, performance satisfaction, self confidence, and decreasing feeling of difficulty, even though there was no statistical significance. When we especially look into the single port, participants took much longer time to finish tasks and gained much less score in suture at the first test, compared with multi-port, however the differences in time or in score between single port and multi-port were narrowed at the final test. In survey, similarly, participants scored less with single port at the first test, however they scored even or a little high with single port at the final test, even though the differences were very small. The results showed the training effect of our program. As program proceeded, participants adapted themselves well to robotic system and showed faster performances, and also they overcame the difficulty and revealed their confidence, satisfaction, and understanding of the technique, with multi-port and single-port. 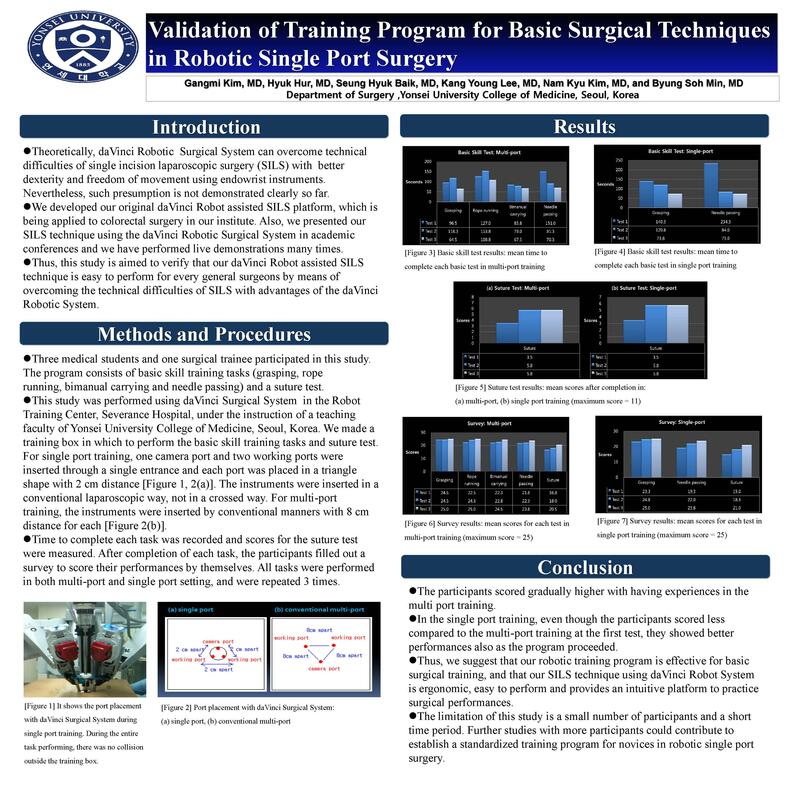 Moreover, our study showed the efficacy of the training program for the single port robotic surgery, exclusively. In general, single port approach is thought to be more challenging for surgeons than multi-port because of less freedom of movement with all instruments which enter the same port. However, our results showed an equivalent or superior training effect in single port surgery compared to multi-port. We suggest that such limitation of single port surgery can be overcome with a specifically designed training program. This is the first pilot study to verify a robotic surgery training program using multi-port and single-port. Further studies with more participants could contribute to establish a standardized training program for novices in robotic surgery.